Background: Coping, the cognitive and behavioral effort required to manage the effects of stressors, is important in determining psychological stress responses (ie, the emotional, behavioral, and cognitive responses to stressors). Coping was classified into categories of emotional expression (eg, negative feelings and thoughts), emotional support seeking (eg, approaching loved ones to request encouragement), cognitive reinterpretation (eg, reframing a problem positively), and problem solving (eg, working to solve the problem). Stress mindset refers to the belief that stress has enhancing (stress-is-enhancing mindset) or debilitating consequences (stress-is-debilitating mindset). This study examined whether coping mediated the relationship between stress mindset and psychological stress responses. Psychological stress responses were conceptualized as depression-anxiety, irritability-anger, and helplessness. The following two hypotheses were tested: 1) a stronger stress-is-enhancing mindset is associated with less frequent use of emotional expression, emotional support seeking, and problem solving, which in turn is associated with lower levels of depression-anxiety, irritability-anger, and helplessness; 2) a stronger stress-is-debilitating mindset is associated with more frequent use of these coping strategies, which in turn is associated with higher levels of these psychological stress responses. Materials and methods: The participants were 30 male and 94 female undergraduate and graduate students (mean age =20.4 years). Stress mindset, coping, and psychological stress responses were measured using self-report questionnaires. Six mediation analyses were performed with stress-is-enhancing mindset or stress-is-debilitating mindset as the independent variable, one of the psychological stress responses as the dependent variable, and the four coping strategies as mediators. Results: Emotional expression partially mediated the relationship between a strong stress-is-debilitating mindset and higher irritability-anger levels. The other three coping strategies did not exhibit mediating effects. None of the coping strategies mediated the relationship between a stress-is-enhancing mindset and psychological stress responses. Conclusion: These results provide initial evidence that stress mindset is associated with psychological stress responses, through coping strategies. A growing body of research has suggested that stress mindset is associated with both coping and psychological stress responses.1,2,4 Crum et al found that individuals with a stronger stress-is-enhancing mindset used approach coping (eg, active coping) more frequently and avoidant coping (eg, disengagement) less frequently, as well as exhibited weaker psychological stress responses relative to individuals with a stress-is-debilitating mindset; in other words, they showed that coping and stress mindset were independently associated with psychological stress responses.1 Aside from this study, little is known about the associations between stress mindset, coping, and psychological stress responses. There may be other interactions among stress mindset, coping, and psychological stress responses. Particularly, as investigated in this study, stress mindset could affect coping, which might in turn alter psychological stress responses. In addition, stress mindset involves meta-cognition about the effects of stress on various outcomes and could therefore affect coping choices. For instance, individuals with a strong stress-is-enhancing mindset could be less likely to choose avoidance coping strategies. However, no studies have been conducted to examine this issue directly. Therefore, the purpose of this study was to assess the mediating effect of coping on the relationship between stress mindset and psychological stress responses. This study adhered to Sasaki and Yamasaki’s5 conceptualization of coping, whereby it is classified into four categories: emotional expression (eg, negative feelings and thoughts), emotional support seeking (eg, approaching loved ones to request encouragement), cognitive reinterpretation (eg, reframing a problem positively), and problem solving (eg, working to solve a problem). Weaker psychological stress responses are associated with less frequent use of emotional expression, emotional support seeking, and problem solving.6 No significant association has been found between cognitive reinterpretation and psychological stress responses.6 Furthermore, stress-is-debilitating mindset has a negative correlation with a stress-is-enhancing mindset (r=−0.79).7 The following two hypotheses were established and tested: 1) a stronger stress-is-enhancing mindset is associated with less frequent use of emotional expression, emotional support seeking, and problem solving, which in turn is associated with lower levels of psychological stress responses; 2) a stronger stress-is-debilitating mindset is associated with more frequent use of these coping strategies, which in turn is associated with higher levels of psychological stress responses. The study was conducted in a public college in the Tohoku region and a private college in the Kyushu region of Japan. In total, 235 undergraduate and graduate students were invited to participate in this study after their university lectures. Of the 136 students who agreed to participate, 12 provided incomplete data; therefore, data for 124 students (30 men and 94 women) were finally analyzed. Participants’ mean age was 20.4 years (standard deviation =2.84). In addition, 21.0% (n=26), 40.3% (n=50), 13.7% (n=17), 18.5% (n=23), and 6.5% (n=8) of participants were freshmen, sophomores, juniors, seniors, and graduate students, respectively. The sample size was determined based on the authors’ research budget rather than a power analysis. Japanese version of the Stress Mindset Measure was used to measure the strength of stress-is-enhancing and stress-is-debilitating mindsets.8 The scale includes four items pertaining to a stress-is-enhancing mindset (eg, “Experiencing stress facilitates my learning and growth”) and four items pertaining to a stress-is-debilitating mindset (eg, “The effects of stress are negative and should be avoided”). Okubo and Takehashi found that these mindsets represent two distinct factors.9 Participants provided responses using a 5-point Likert-type scale ranging from 0 (strongly disagree) to 4 (strongly agree). Item scores for each mindset are summed, with higher scores indicating a stronger stress-is-enhancing mindset or stress-is-debilitating mindset. The internal consistency reliability for the scale was adequate in the present sample, with Cronbach’s α values of 0.79 for the stress-is-enhancing mindset and 0.74 for the stress-is-debilitating mindset. Ethical approval for the study was granted by the institutional review board of Kurume University (no. 296). The study was conducted between June and July 2017. Participants received thorough explanations regarding the study purpose and procedure, possible publication of the results following data analysis, participants’ rights (eg, the right to refuse to participate or withdraw their participation at any time without penalty), and the voluntary nature of participation. Written informed consent was obtained before the participants completed the questionnaires. The data were analyzed using SPSS Statistics 23 for Windows and the PROCESS macro (ver. 2.16) for SPSS Statistics. Six mediation analyses were performed to examine the mediation models and test the hypotheses stated above. Each analysis included either the stress-is-enhancing mindset or the stress-is-debilitating mindset as the independent variable, one psychological stress response as the dependent variable, and the four coping strategies as the mediating variables. The remaining stress mindset and psychological stress responses were included as control variables. Fulfillment of the following four conditions indicated mediation: 1) a significant total effect, whereby the effect of the independent variable on the dependent variable occurred without controlling for the effect of the mediator on the dependent variable; 2) a significant effect of the independent variable (ie, stress mindset) on the mediating variable (ie, coping); 3) relative to the total effect observed in (1), a smaller direct effect of the independent variable on the dependent variable, after controlling for the effect of the mediator on the dependent variable; and 4) a significant indirect effect of coping.11 The indirect effect of coping was considered significant if the 95% bias-corrected confidence interval (BCCI) did not include zero when conducting the bias-corrected bootstrapping with a resampling size of k=5,000. Resampling was determined based on the study conducted by Takagaki et al.12 These four conditions were examined sequentially. If any condition was not fulfilled, the subsequent condition was not examined. Table 1 shows the means and standard deviations of all variables, as well as the correlations between them. The results of the mediation analyses involving depression-anxiety, irritation-anger, and helplessness as dependent variables are shown in Figures 1, 2, and 3, respectively. In the mediation analyses with depression-anxiety as the dependent variable (Figure 1), the total effects of the stress-is-enhancing (estimate =0.07, 95% confidence interval (CI) [−0.13, 0.26], p=0.50) and stress-is-debilitating (estimate =−0.01, 95% CI [−0.21, 0.21], p=0.96) mindsets on depression-anxiety were nonsignificant. Therefore, coping did not mediate the relationships between either mindset and depression-anxiety. Figure 1 Mediation models of coping on the relationship between stress-is-enhancing mindset (upper) or stress-is-debilitating mindset (lower) and depression-anxiety with the other stress mindset, irritation-anger and helplessness as the control variables. Solid and dashed arrows represent significant and nonsignificant effects, respectively. Abbreviations: SEM, stress-is-enhancing mindset; SDM, stress-is-debilitating mindset; EE, emotion expression; ESS, emotional support seeking; CR, cognitive reinterpretation; PS, problem solving; DA, depression-anxiety. In the mediation analyses with irritation-anger as the dependent variable (Figure 2), the total effect of a stress-is-enhancing mindset on irritation-anger was nonsignificant (estimate =0.10, 95% CI [−0.13, 0.34], p=0.40), whereas the total effect of the stress-is-debilitating mindset was significant (estimate =0.24, 95% CI [0.001, 0.48], p=0.049). 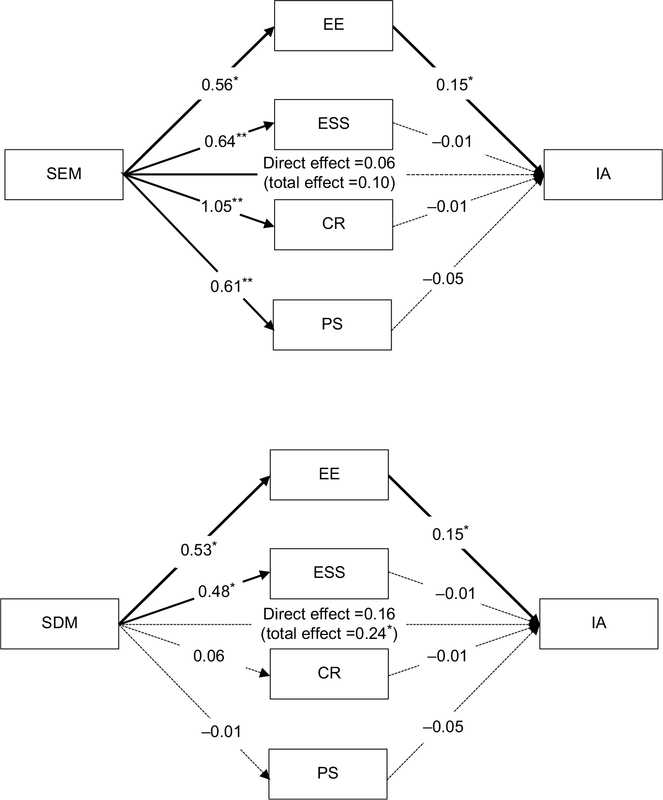 The effects of the stress-is-debilitating mindset on emotional expression (estimate =0.53, 95% CI [0.07, 1.00], p=0.02) and emotional support seeking (estimate =0.48, 95% CI [0.08, 0.87], p=0.02) were significant, while those on cognitive reinterpretation (estimate =0.06, 95% CI [−0.41, 0.53], p=0.81) and problem solving (estimate =−0.01, 95% CI [−0.34, 0.32], p=0.96) were nonsignificant. The direct effect of a stress-is-debilitating mindset on irritation-anger (estimate =0.16, 95% CI [−0.08, 0.40], p=0.18) was smaller relative to the total effect (estimate =0.24) after controlling for the mediators. 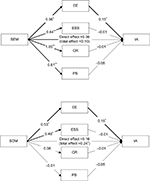 The indirect effect of the stress-is-debilitating mindset on irritation-anger through emotional expression (estimate =0.08, BCCI [0.01, 0.21]) was significant, while that of emotional support seeking was nonsignificant (estimate =0.00, BCCI [−0.08, 0.06]). Thus, of the four coping strategies, emotional expression partially mediated the relationship between the stress-is-debilitating mindset and irritation-anger. Figure 2 Mediation models of coping on the relationship between stress-is-enhancing mindset (upper) or stress-is-debilitating mindset (lower) and irritation-anger with the other stress mindset, depression-anxiety and helplessness as the control variables. Solid and dashed arrows represent significant and nonsignificant effects. Abbreviations: SEM, stress-is-enhancing mindset; SDM, stress-is-debilitating mindset; EE, emotion expression; ESS, emotional support seeking; CR, cognitive reinterpretation; PS, problem solving; IA, irritation-anger. 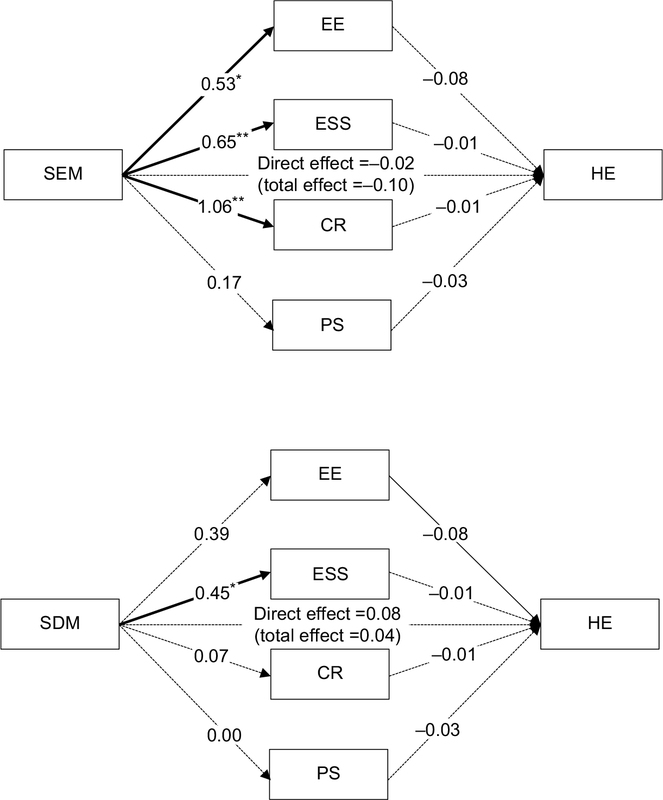 In the mediation analyses with helplessness as the dependent variable (Figure 3), the total effects of the stress-is-enhancing (estimate =−0.10, 95% CI [−0.33, 0.13], p=0.39) and stress-is-debilitating (estimate =0.04, 95% CI [−0.19, 0.27], p=0.72) mindsets on helplessness were nonsignificant. Therefore, coping did not mediate the relationships between the mindsets and helplessness. Figure 3 Mediation models of coping on the relationship between stress-is-enhancing mindset (upper) or stress-is-debilitating mindset (lower) and helplessness with the other stress mindset, depression-anxiety and irritation-anger as the control variables. Solid and dashed arrows represent significant and nonsignificant effects. Abbreviations: SEM, stress-is-enhancing mindset; SDM, stress-is-debilitating mindset; EE, emotion expression; ESS, emotional support seeking; CR, cognitive reinterpretation; PS, problem solving; HE, helplessness. The purpose of this study was to assess the mediating effect of coping on the relationship between stress mindsets and psychological stress responses. The first hypothesis that a stronger stress-is-enhancing mindset would be associated with less frequent use of emotional expression, emotional support seeking, and problem solving, which in turn would be associated with lower levels of psychological stress responses, was not supported. The second hypothesis that a stronger stress-is-debilitating mindset would be associated with more frequent use of these coping strategies, which in turn would be associated with higher levels of psychological stress responses, was partially supported. A stronger stress-is-debilitating mindset was associated with more frequent use of emotional expression, which was associated with higher levels of irritability-anger. However, the mediating effects of emotional expression were not observed for depression-anxiety or helplessness, and no mediating effects were observed for emotional support seeking, cognitive reinterpretation, or problem solving. The results of this study contribute to the existing literature on the relationships between stress mindset, coping, and psychological stress responses, as follows. First, the study represents the first direct assessment of the mediating effect of coping on the relationship between stress mindset and psychological stress response. More specifically, the results provide the first direct evidence that emotional expression mediates the relationship between a stress-is-debilitating mindset and psychological stress responses. 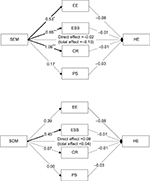 Previous research has examined only the correlations between these variables or the direct effects of coping or stress mindset on psychological stress responses.1 Crum et al1 conducted correlation analyses to examine the relationships between a stress-is-enhancing mindset, coping, and psychological stress responses but did not examine coping directly as a mediator of the relationship between the other two variables. The current study examined the mediating role of coping directly and provided robust evidence that coping is a mediating variable. However, the evidence was not strong. Only 1 of 24 potential mediating effects of coping was significant. Despite the weakness of this evidence, the current results still add to the literature by demonstrating the need to consider coping as a mediator of the relationship between stress mindset and psychological stress responses. Failure to consider this potential mediating effect and examining only the direct effects of stress mindset and coping on psychological stress responses could have diverted attention away from the complex interplay between these variables. Future research would benefit from the consideration and examination of the mediating effects of coping. The results of this study provide a rationale for the examination of these effects in future studies. Second, the current results demonstrate the relative importance of the stress-is-enhancing and stress-is-debilitating mindsets in understanding these relationships. The mediating effect of emotional expression was significant only for the stress-is-debilitating mindset. In other words, stronger beliefs in the negative effects of stress, rather than stronger beliefs in the positive effects of stress, were associated with the participants’ choice of emotional expression, which was in turn associated with higher levels of irritation-anger. Crum et al assessed the stress-is-enhancing mindset using the Stress Mindset Measure, which is a single scale consisting of four items pertaining to the stress-is-enhancing mindset and four items pertaining to the stress-is-debilitating mindset.1 The stress-is-debilitating mindset items are reverse scored. However, the results of this study suggest that these two mindsets could have different stress-related correlates. Therefore, separate examination of these mindsets could be important. It remains unclear why the stress-is-enhancing mindset was not associated with psychological stress response through coping. One possible explanation is that the association of this mindset with positive events is stronger relative to that with negative events such as stressors. Kilby and Sherman reported that individuals with a stronger stress-is-enhancing mindset were more likely to appraise a potential stressor (ie, a mathematics task) as challenging.4 In other words, these individuals were less likely to be stressed and more likely to report positive experiences, such as positive emotions, when they encountered potentially stressful events. By contrast, individuals with a weaker stress-is-enhancing mindset were more stressed and reported negative experiences such as negative emotion. This hypothesis should be tested in future research. The finding that emotional expression mediates the relationship between a stress-is-debilitating mindset and irritation-anger might provide potentially useful information to stress management interventionists. The majority of stress management interventions focus on cognitive appraisals and coping, with few focusing on stress mindsets. Our findings indicate that cognitions about the adverse effects of stress (as opposed to its enhancing effects) can influence affective coping, which in turn affects irritation-anger. Importantly, stress mindset is open to change. If this mediating effect is replicated consistently, the stress-is-debilitating mindset might be another important target for stress management interventions. This study was subject to some limitations. For example, the study used a cross-sectional design, making it impossible to infer causality in the relationships between the stress-is-debilitating mindset, emotional expression, and psychological stress responses. This limitation is important, as mediating effects observed in cross-sectional studies are not necessarily replicated in longitudinal research.13 However, the current findings provide a rationale for conducting longitudinal and experimental studies involving direct examination of the causality of the observed relationships. In addition, the sample included only college students and was small, so it is unclear whether the findings could be generalized to other student or nonstudent populations. Therefore, the current findings should be replicated in studies with larger, more diverse samples. The sample size was also not based on a priori power analysis; however, the results provided enough evidence to calculate an appropriate sample size. Furthermore, the study focused on four types of coping based on a study conducted by Sasaki and Yamasaki.5 However, there are various conceptualizations of coping and numerous coping scales,14,15 which should be used to replicate and extend the current findings in the future. This work was supported by JSPS KAKENHI, Grant Number 15H03459. Crum AJ, Salovey P, Achor S. Rethinking stress: the role of mindsets in determining the stress response. J Pers Soc Psychol. 2013; 104(4):716–733. 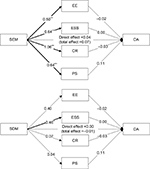 Crum AJ, Akinola M, Martin A, Fath S. The role of stress mindset in shaping cognitive, emotional, and physiological responses to challenging and threatening stress. Anxiety Stress Coping. 2017;30(4):379–395. Kilby CJ, Sherman KA. Delineating the relationship between stress mindset and primary appraisals: preliminary findings. Springerplus. 2016;15(1):188–336. Sasaki M, Yamasaki K. Development of a dispositional version of the General Coping Questionnaire (GCQ) and examination of its reliability and validity. Nihon Koshu Eisei Zasshi. 2002;49(5):399–408. Japanese. Shimanoe C, Hara M, Nishida Y, et al. Perceived stress and coping strategies in relation to body mass index: cross-sectional study of 12,045 Japanese men and women. PLoS One. 2015;10(2):e0118105. Marten F. The mediating effect of eustress and distress on the relation between the mindset towards stress and health; 2017 [cited July 12, 2017]. Available from: http://purl.utwente.nl/essays/72588. Accessed July 27, 2017. Kanzaki A. Stanford’s Textbook to Translate Stress into Power (translated by authors). Tokyo: Daiwashobo; 2015. Japanese. Okubo K, Takehashi H. Examination of reliability and validity of a Japanese version of the Stress Mindset Measure. Proceedings of the 57th Annual Congress of the Japan Society of Social Psychology; 2016 September 17–18; Hyogo, Japan (translated by authors). Available from: http://www.team1mile.com/jssp2016/P2142.pdf. Accessed July 27, 2017. Suzuki S, Shimada H, Miura M, Katayanagi K, Umano R, Sakano Y. Development of a new psychological stress response scale (SRS-18) and investigation of the reliability and the validity. Jpn J Behav Med. 1997;4(1):22–29. Preacher KJ, Hayes AF. Asymptotic and resampling strategies for assessing and comparing indirect effects in multiple mediator models. Behav Res Methods. 2008;40(3):879–891. Takagaki K, Okamoto Y, Jinnin R, et al. Mechanisms of behavioral activation for late adolescents: positive reinforcement mediate the relationship between activation and depressive symptoms from pre-treatment to post-treatment. J Affect Disord. 2016;204:70–73. Maxwell SE, Cole DA, Mitchell MA. 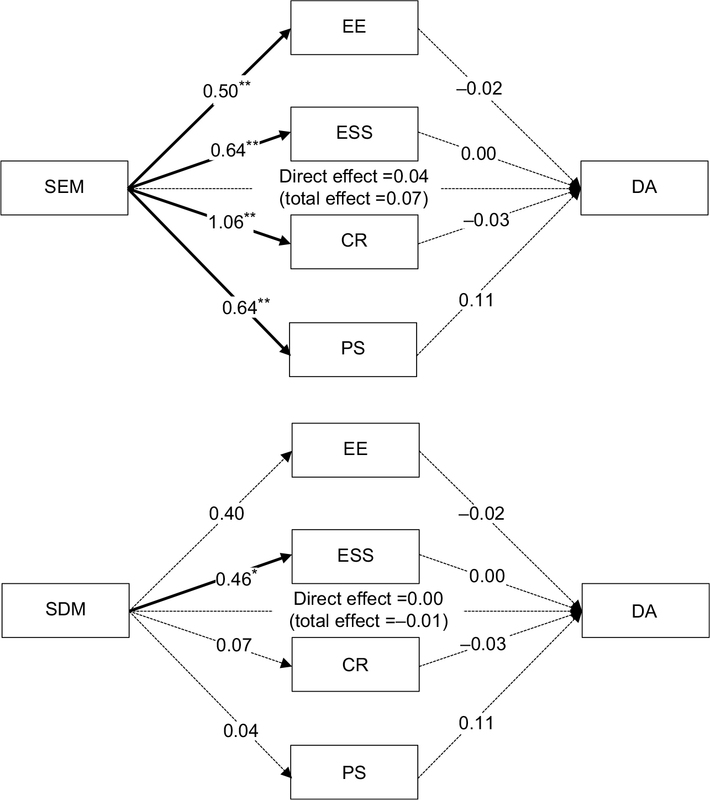 Bias in cross-sectional analyses of longitudinal mediation: partial and complete mediation under an autoregressive model. Multivariate Behav Res. 2011;46(5):816–841. Kato T. Frequently used coping scales: a meta-analysis. Stress Health. 2015;31(4):315–323. Garcia C. Conceptualization and measurement of coping during adolescence: a review of the literature. J Nurs Scholarsh. 2010;42(2):166–185.